What’s the best way to get more of the plants you love? Divide the ones you have! On the other hand, this isn’t the only reason to divide: Sometimes plants need to be split — they’ll let you know when it’s time. The good news is that the process is simple and easy to do, though it looks a little different depending on the roots of the plant. Let’s walk through a few of the basics to make sure you can divide your plants in the right way and at the right time. A good rule of thumb is to dig 4 to 6 in. away from the base of the plant. That way you’ll get plenty of roots as you lift the clump out of the ground. In the photo at above, we’ve dug all the way around the phlox. Actually, there is no need to completely lift the plant up and out — all of that soil can be heavy. Instead, the easy method is to simply tilt the whole mass of soil back on the blade of your spade so you can see the roots and break, or cut, the old plant into smaller sections. Often the soil falls away. If not, scrape or shake some of the excess off so you have some “wiggle” room to gently pull or cut the divisions. Sometimes the roots are easy to break apart with your hands or a shovel, but for tough and strong roots, a soil knife with a serrated edge makes the task easier. 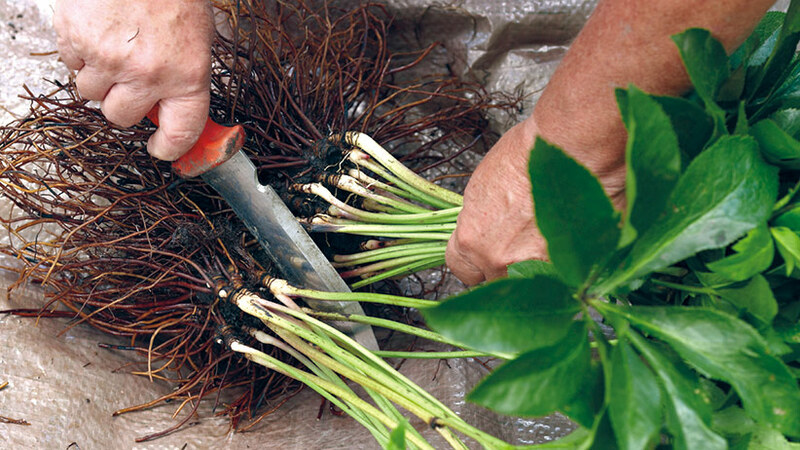 After you dig out your plant, take a look at the roots before you start separating the plant. 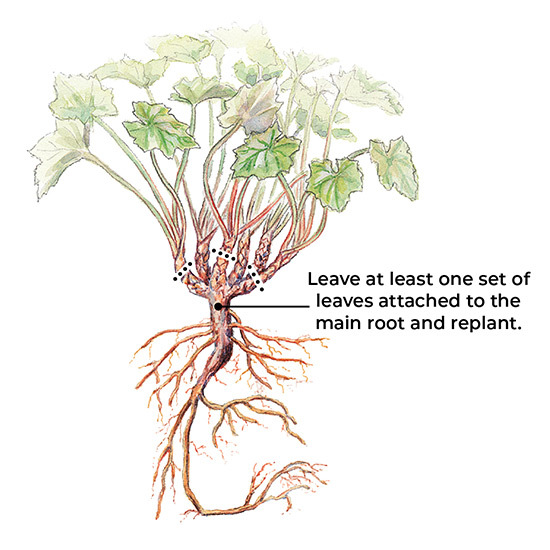 Not all perennials have the same types of roots. Look at the illustrations below to decide which category your plant fits into. Then you can make the correct cut. The dotted lines let you know where you should make dividing cuts on each type of plant. You can divide into small sections with just one stem attached to a few roots. But for a bigger impact faster, leave three to seven stems on each new division. Can’t decide which roots most closely match your plant? See our chart of over 40 perennials that will let you know which type of root system each has, the best time to divide it and some other helpful tips. 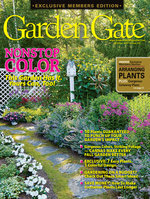 Most perennials fall into one of three categories — spreaders, clumpers and those with woody crowns. Each type has a few quirks you need to know as you dig it out of the ground and separate it into new plants. Learn a bit about each below. Many ground covers, like the bugleweed above, spread by modified stems that root where they touch the ground. It’s easy to dig up the newly formed “baby” plants and transplant them. 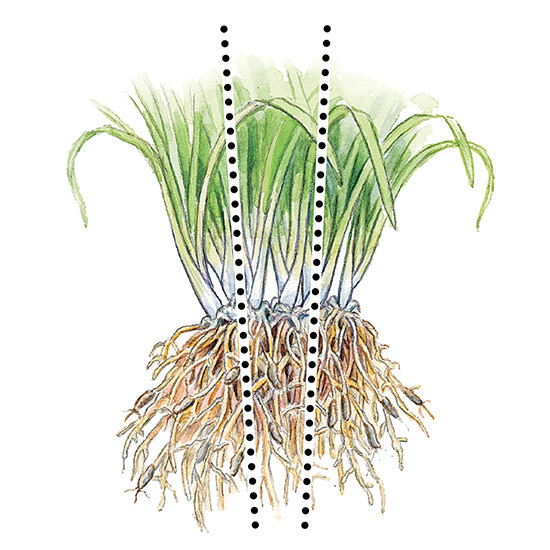 Dividing plants with fibrous or spreading roots like this daylily is easy. Dig up the whole clump and pull or cut the root ball apart. 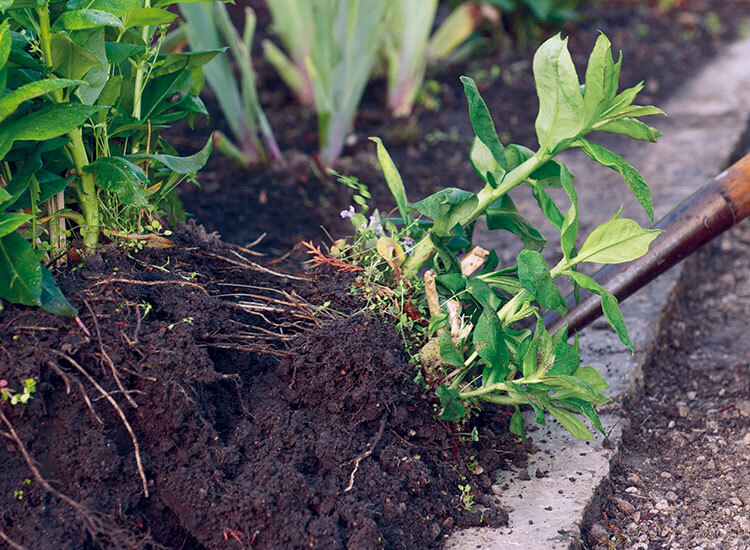 Or just dig out a chunk along the edge, if you don’t mind a gap in your plant for a season. Some plants, such as the coral bells above, have a woody crown. Dig up the whole plant and shake off the soil. 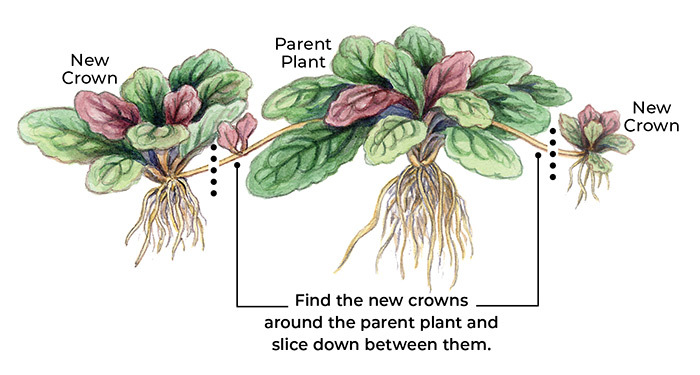 Cut off sections of crown, each with a few leaves, and replant them individually. When’s the best time to divide plants? Now that you know how, let’s talk about when. 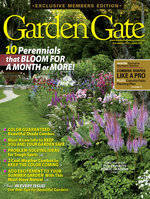 If possible, choose a cool and cloudy day to dig perennials out of the ground. Spring or fall is usually less stressful than the heat of summer. But if you have to divide when it’s hot, we have some handy tips for helping plants adjust below. 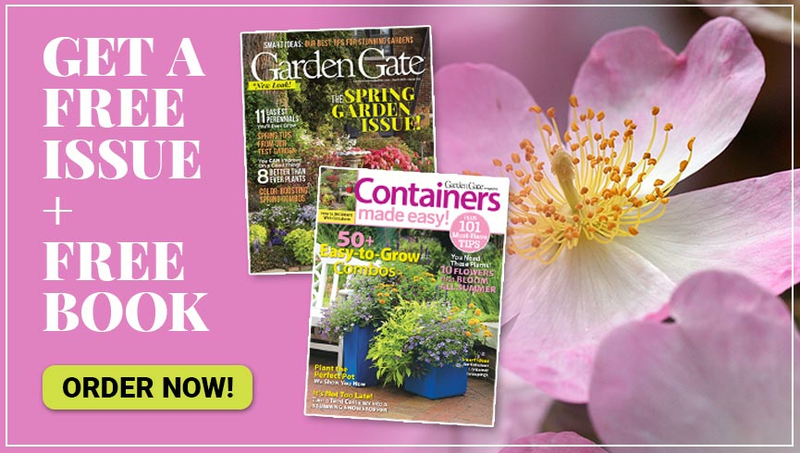 If you want to know which season is best for your particular plant, check out our list of how to divide 45 perennials for more specific information. Dividing and transplanting in cool weather isn’t always practical. In July, if you find you need to move a plant, even though it’s 90 degrees and sunny, here are some secrets that will help ensure your plants’ survival. Start by watering the plant and its future home the day before you dig. The next day cut the foliage back by half: This way a smaller root system won’t have to support lots of foliage in the heat. Next, dig the hole where the new divisions will be set. You’re now ready to dig the plant out of the ground and divide just as you would at any other time of year. Once you have a division set into its new spot, fill the hole halfway with soil and soak it thoroughly. Fill the hole the rest of the way with soil, water it again and put down a layer of mulch. Keep the area wet for a few days. If the plant wilts in late evening or early morning, water again. And a little protection from the sun is a good idea, too.